Israeli soldiers abducted, on Wednesday at dawn, three young Palestinian men, from Jenin refugee camp, and Qabatia town, south of Jenin city, in the northern part of the occupied West Bank. 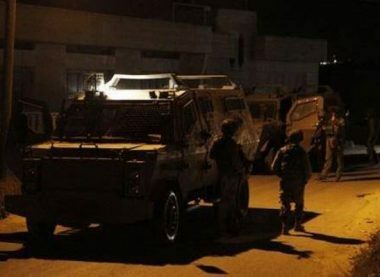 The Jenin office of the Palestinian Prisoners’ Society (PPS) has reported that many army vehicles invaded Jenin refugee camp, before the soldiers stormed and ransacked homes. It added that the soldiers abducted two young men, identified as Mohannad Gharra Bani Odah and Ammar Turkman. Furthermore, the soldiers invaded and searched homes in Qabatia town, and abducted a former political prisoner, identified as Khaled Khalil Kamil. In related news, the soldiers abducted twenty-two Palestinians, including the governor of occupied Jerusalem, Adnan Gheith, and a lawyer, identified as Midhat Deebiyya, from their homes Silwan and the al-‘Isawiya towns. The army also abducted three Palestinians in Hebron governorate, in the southern part of the West Bank.